The first recorded doctor on the Ballarat goldfields was Dr. Richard Power, who had been the resident doctor for the (pre gold rush) township of Buninyong. When the gold rush in Buninyong and Golden Point Ballarat commenced in August 1851, Dr. Power was overwhelmed by demands for his services so he took Dr. William Rankin, a young doctor from Edinburgh as a partner. Rankin fell in love with and married Power’s daughter, and after the sudden death of Dr. Power, continued his practice in Buninyong and Ballarat, taking on a new partner, Dr. James Townley Graham. This excerpt from the Geelong Advertiser in 1846 mentions Dr. Power visiting a patient who has been struck on the head. The patient dies and the person who hit him is tried for murder. If you read the article you may think Dr. Power’s treatment helped to kill the man. Unfortunately it was not always easy to find out if a doctor was qualified or not. Many people lost their lives to impostors and quacks. Medical practitioners were not required to be registered in Victoria until 1862. A letter to the editor by “Medicus” in the Australian Medical Journal of April 1857 complains about the “Many Unprincipled Druggists upon the Goldfields” ,and states “they deceive the community, obtain money under false pretences, rob the profession, and last, though not least, do an incalculable amount of injury”. Medicus also claims “Midwifery is in the hands of illiterate women, and a large proportion of them are drunkards”. Medicus states many cases of unqualified medicos and the problems they cause throughout his editorial, including a claim that one of the midwives kept a “sly grog shop” (Illegally selling alcohol). 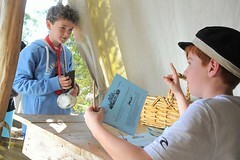 Even if you were a qualified medical practitioner, identifying yourself in a maze of tents on the goldfields could be quite difficult. 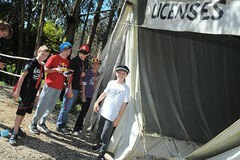 Flags were in common use to help identify people. 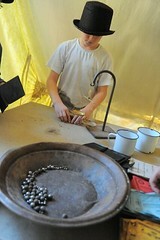 An Apothecarist on the Ballarat diggings used a flag with a large pestle and mortar (The symbol for Apothecarists). The Geelong Advertiser and Intelligencer, 11th Dec 1852 has an advertisement for Dr. Leman (2nd column from right, under Medical), who could be found at his tent, blue flag with a white border, near Scott’s store, Eureka Flat. Without a hospital, the work of a doctor was very limited, and treatment of serious injuries, which were common on the goldfields, required a suitable place for sick diggers to be treated and to recover. 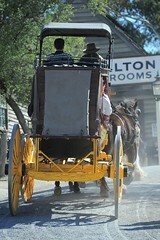 The nearest public hospital to Ballarat in the early years of the gold rush was Geelong, much too far to transport sick patients in wagons or bullock drays. There was a hospital at the government camp, but it was reserved for government employees, soldiers, policemen and administrative staff. 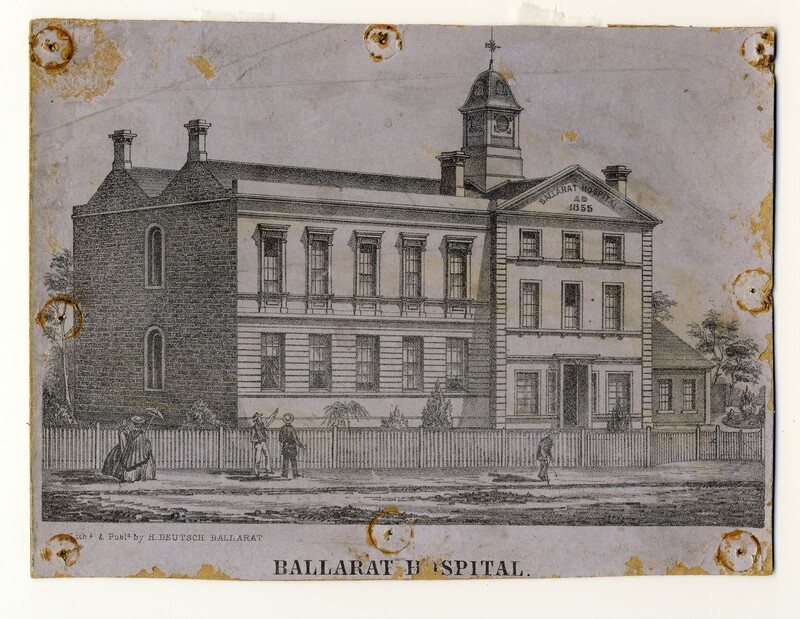 Ballarat Hospital circa 1856. Gold Museum Collection. Dr. Alfred Carr, who was still in Ballarat during the Eureka uprising, called for the government to supply some land and use the revenue from gold licences to build a public hospital in the Melbourne Argus, 19 March 1853. 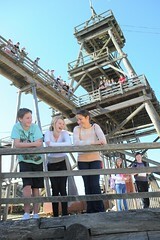 It wouldn’t be until 1856 that a public hospital was opened in Ballarat. Before this time, the sick stayed, and were treated in their own tents, the hotels or the two private tent hospitals, at Red Hill and Bakery Hill. 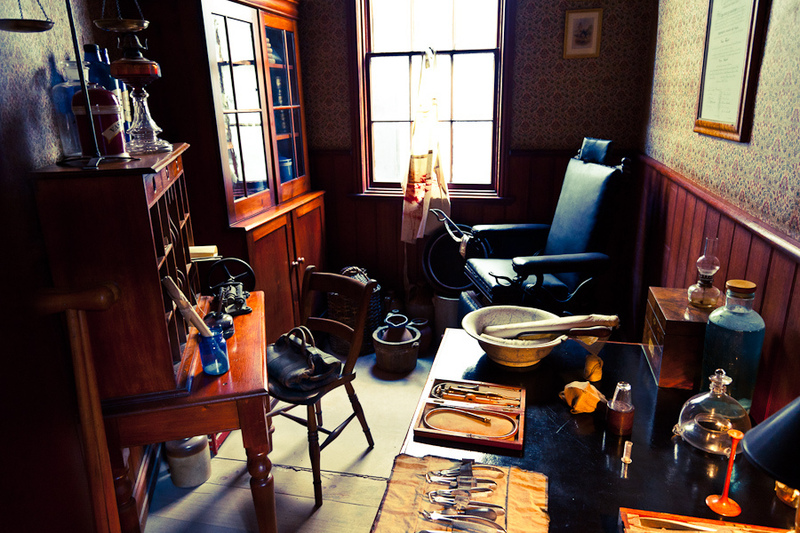 Dr. Wakefield’s room at Sovereign Hill. Some doctors had their own rooms where they could see and treat sick diggers and their families. One such was Dr. Wakefield. He emigrated from England in 1853 at the age of 28. George Wakefield was a trained Apothecary, like his father, and had run a successful business in London before moving to Australia. He ran a practice at Emerald Hill, Melbourne until 1856 when he moved to Ballarat. Here he worked as a dispensing chemist and doctor, until he moved to Kerang in the 1870’s. 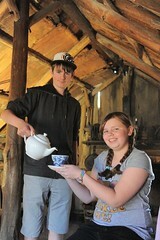 Sovereign Hill has re-created Dr. Wakefield’s consulting room at the back of Robinson’s and Wayne’s Apothecary. 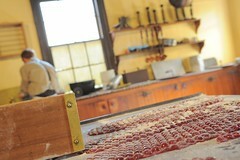 It is well worth a visit to look at some of the gruesome tools of his trade. If we take a closer look at some of the treatments doctors used during the gold rush period, we might wonder how any of their patients got better. It was still commonly believed that disease was spread by bad smells rather than from poor hygiene or contaminated water. In many cases the doctors could treat symptoms of medical conditions, but the knowledge of how to cure these diseases had not yet been discovered. Combined with this was the variety of serious diseases and the large amount of injuries suffered by diggers on the goldfields. Chloroform was just being introduced as a form of anaesthetic, so doctors could now put their patients to “sleep” before operating on them, but many of the treatments had changed very little in centuries. For example there is the sad case of the Longmore family (Nine children and two parents), of Lake Learmonth in June of 1856. Both Parents and seven of their children would die of Diphtheria, however some of the practices of the doctors were criticised by many people including the children’s uncle, Francis Longmore in the Ballarat Star, who stood between the doctor and his three year old niece to stop him carrying out his “murderous treatment”. Some of the treatments used by the doctors included; leeches placed on the sides of the neck, scraping away the membrane in the throat with a spoon, applying carbolic acid to the throat, solutions of silver nitrate, chloride of iron and nitric acid, carrot and turnip poultices on the neck and deliberately causing a blister on the chest. Dr Mount’s reply to these accusations is here. Bleeding and “cupping”, sometimes referred to as “venesection” were also common forms of treatment which doctors believed could help balance the four “humours” in the body. In general it was not a good idea to call a doctor unless you were dying, as it seems the treatment would probably kill you anyway. Cupping Kit, from Dr. David O’Sullivan Collection. 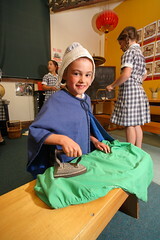 Gold Museum Ballarat. This is a “Cupping set”, which would be used to take blood from a patient. The brass instrument in the centre would be placed over a vein and small blades would swing out to “scarify” or cut open the skin to allow blood to escape. This was known as bleeding. A heated glass jar could then be placed on the cut to help extract the blood by suction. This was called “wet cupping”. 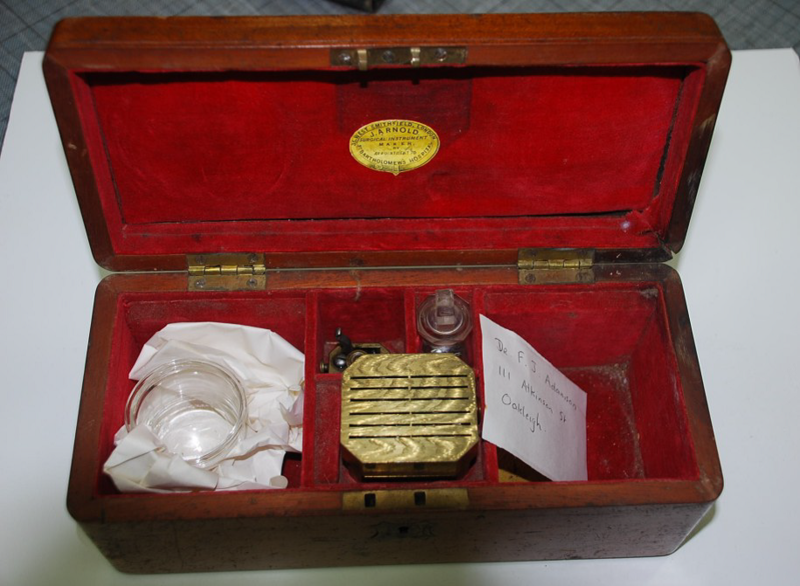 There were many different concoctions used by medical practitioners during the gold rush, some worked some didn’t, but we will leave that for a future blog on Apothecarys and medicines. Do you know of any strange home remedies? Let us know about it. 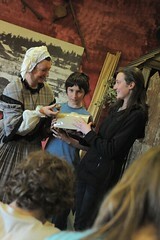 This entry was posted in History Teaching, Victorian Gold Rush and tagged 1850s health, gold rush, medicine. Bookmark the permalink. What kind of medicines where used for different diseases? Is there anyone i could talk to about more info on the topic of medicine? What do you want to know Biannnnca? Dr William Rankin is my great great grandfather. Do you have a picture or any further information about him.